The past two years have meant a lot for the Capstone Agency. The nationally affiliated, student-run firm brought home first place in the Bateman Case Study Competition, as well as the Teahan Chapter Award for best student-run firm. In a matter of a few years, the reputation of the Capstone Agency has gone from great to elite and this is not accidental. The process of becoming the nation’s top firm has a support structure of intentionality, hard work and time. And still—with improvement being a fixed priority—the firm isn’t slowing down. The key way that Capstone Agency develops students is through the process of mentorship. Younger, less-experienced students are given opportunities to ask questions, to learn on the go and to spend time treading the footsteps of their similarly ambitious peers. 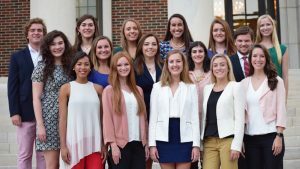 Katie Gatti, firm director, entered the firm as a second-semester freshman. Early on, she held agency office hours that put her in close proximity to senior firm members. Because of this, she’s a great example of just how far the mentorship experience can take you. Questions she asked about how to structure documents and when to apply for job postings would lead to bigger conversations that would shape not just her experience in Capstone Agency, but also the direction of the entire firm. These students are committed to finding opportunities to learn from one another. They also legitimately want to help each other. At a potluck dinner, there are two kinds of people: those who will brag about the “family secret” in their prized baked beans and those who will give you the entire recipe. Capstone Agency students are the latter. The agency has also begun offering workshops for their students to help them prepare for the workplace, put together resumes and market their experience in the agency to interested employers. These workshops are the direct result of conversations and eureka moments that older students had when they were the younger agency members. The experience alone is far more than workshops and mentorship. Capstone Agency members are getting a real look at what it takes to work in a communications firm. Imagine being fresh out of college and headed into an interview for a big firm. How much better would it be to have real-life experience applicable to the job you’re applying for? This is the kind of opportunity that Capstone Agency is currently providing for its students. 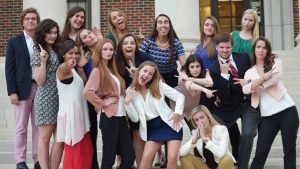 Being a nationally recognized communications firm may indicate to the casual observer that Capstone Agency is only for upper class students majoring in advertising and public relations, but the agency isn’t limited to these kinds of students. In fact, the current leadership encourages freshmen and sophomore students to apply, and the skillset isn’t limited to a particular field of study. Mentorship and real-world experience aren’t the only things driving the firm forward. The friendships that Capstone Agency members have forged through all of their time together have given their working relationships an added benefit. These close-working relationships are more than passing friendships; they’re future contacts and partners in the communications industry. “I think because we share these common passions, we have deeper relationships,” Gatti said. Applications are officially open for next semester’s Capstone Agency members and will close on January 6. Dedicated, hard-working students who have strong aspirations for success and want to learn on the go are welcome to apply. Click here to access the Capstone Agency application.